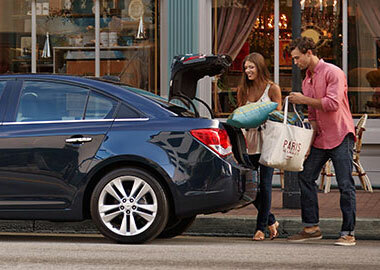 The only small domestic diesel car, Cruze Clean Turbo Diesel† offers up to 46 MPG highway. The engine features the latest in advanced clean diesel technology to reduce emissions without sacrificing performance. Introducing the 2.0L turbocharged clean diesel engine in the 2015 Cruze Clean Turbo Diesel. It generates at least 90% less nitrogen oxide (NOx) and particulate emissions compared to previous-generation diesels. 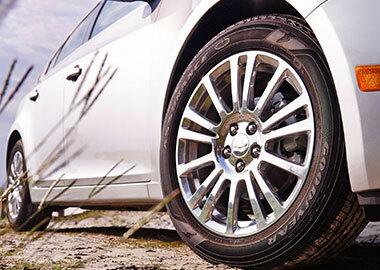 17" forged lightweight polished alloy wheels with ultra-low rolling resistance tires on Cruze Eco. A prominent grille, refined front fascia and swept-back available LED daytime running lights all come together to produce a bold and sporty presence on the road. Find plenty of room for cargo with an impressive 15.4 cubic feet of cargo space for larger items. Access to available 4G LTE with Wi-Fi® means the days of chasing down a Wi-Fi® connection are over. When your Cruze is running, you’ll have a more powerful connection than a smartphone or mobile hotspot. It’s a fast and reliable connection that doesn’t rely on your mobile device’s battery. Refinements such as soft-touch interiors, rich colors and available heated leather-appointed front seats give Cruze an upscale feel. And you’ll enjoy a quiet drive with a triple-sealed laminated windshield, one of 30 acoustical treatments designed to help keep outside noise where it belongs — outside. It’s called a compact car, but you’d never notice once you get inside. The spacious interior of Cruze not only has more passenger room than Ford Focus Sedan. It also beats Focus out with more cargo space. And Cruze is smart about how to use all that space with 60/40 split-folding rear seats so you can find room for larger items. With available Chevrolet MyLink, all your favorites are in one place, conveniently displayed on the 7-inch diagonal color touch-screen. Stream music, get directions, access your contacts and more. Just connect your compatible smartphone via Bluetooth® wireless technology or USB port. Use voice or steering wheel controls and the touch-screen to access features such as hands-free calling and texting, available SiriusXM® Satellite Radio, Pandora®, Stitcher SmartRadioTM and all your own MP3s. Connect your compatible smartphone to the 2015 Cruze with Bluetooth® wireless technology and get access to your music, contacts, hands-free calls and more. Bluetooth® connectivity for your phone is standard on every model and allows you to enjoy the ride that much more while keeping your hands safely on the wheel. The myChevrolet and OnStar RemoteLink® mobile apps let you remotely start your Cruze (if factory equipped), check diagnostics, unlock doors from anywhere in America with a phone signal, contact roadside assistance and more. Available for download from the iTunes Store and Google Play. The 2015 Cruze comes equipped with an impressive slate of standard safety features, including the StabiliTrak® Electronic Stability Control System with Traction Control. On slippery surfaces, StabiliTrak® helps keep Cruze on the road by detecting the difference between the direction you’re steering and the direction the vehicle is actually traveling. 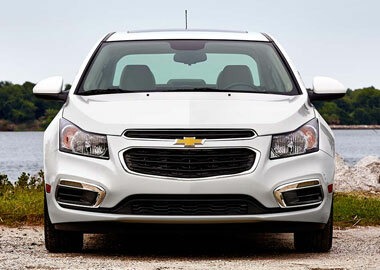 It then uses the brakes and, if necessary, adjusts engine torque to help keep your Cruze on track. Cruze is the first car in its class to have 10 standard air bags, side-impact and knee air bags help protect you and your front passenger, and a high-strength steel safety cage and roof-crush resistance surpass requirements.. In the event of a collision, crucial information will be sent to the OnStar® Command Center via the OnStar® Automatic Crash Response system. Trained Advisors can then utilize GPS technology to determine your exact location and request emergency assistance — even if you’re unable to respond. It’s part of the OnStar® Directions & Connections Plan®, standard for six months.